This article is about the country. For other uses, see Palau (disambiguation). Not to be confused with Paelau. Palau (/pəˈlaʊ/ ( listen), historically Belau, Palaos, or Pelew), officially the Republic of Palau (Palauan: Beluu er a Belau), is an island country located in the western Pacific Ocean. The country contains approximately 340 islands, forming the western chain of the Caroline Islands in Micronesia, and has an area of 466 square kilometers (180 sq mi). The most populous island is Koror. The capital Ngerulmud is located on the nearby island of Babeldaob, in Melekeok State. Palau shares maritime boundaries with the Philippines, Indonesia, and the Federated States of Micronesia. The country was originally settled approximately 3,000 years ago by migrants from Insular Southeast Asia. The islands were first explored by Europeans in the 16th century, and were made part of the Spanish East Indies in 1574. Following Spain's defeat in the Spanish–American War in 1898, the islands were sold to Imperial Germany in 1899 under the terms of the German–Spanish Treaty, where they were administered as part of German New Guinea, although the islands were already represented in the Malolos Congress of the revolutionary First Philippine Republic. The Imperial Japanese Navy conquered Palau during World War I, and the islands were later made a part of the Japanese-ruled South Pacific Mandate by the League of Nations. During World War II, skirmishes, including the major Battle of Peleliu, were fought between American and Japanese troops as part of the Mariana and Palau Islands campaign. Along with other Pacific Islands, Palau was made a part of the United States-governed Trust Territory of the Pacific Islands in 1947. Having voted against joining the Federated States of Micronesia in 1979, the islands gained full sovereignty in 1994 under a Compact of Free Association with the United States. Politically, Palau is a presidential republic in free association with the United States, which provides defense, funding, and access to social services. Legislative power is concentrated in the bicameral Palau National Congress. Palau's economy is based mainly on tourism, subsistence agriculture and fishing, with a significant portion of gross national product (GNP) derived from foreign aid. The country uses the United States dollar as its currency. The islands' culture mixes Micronesian, Melanesian, Asian, and Western elements. Ethnic Palauans, the majority of the population, are of mixed Micronesian, Melanesian, and Austronesian descent. A smaller proportion of the population is descended from Japanese and Filipino settlers. 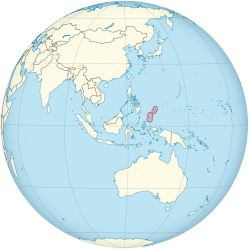 The country's two official languages are Palauan (a member of the Austronesian language family) and English, with Japanese, Sonsorolese, and Tobian recognized as regional languages. The name for the islands in the Palauan language, Belau, likely derives from either the Palauan word for "village", beluu, or from aibebelau ("indirect replies"), relating to a creation myth. The name "Palau" entered the English language from the Spanish Los Palaos, via the German Palau. An archaic name for the islands in English was the "Pelew Islands". Palau is unrelated to Pulau, which is a Malay word meaning "island" found in a number of place names in the region. Palau was originally settled between the 3rd and 2nd millennia BCE, most likely from Indonesia or the Philippines. Sonsorol, part of the Southwest Islands, an island chain approximately 600 kilometers (370 mi) from the main island chain of Palau, was sighted by Europeans as early as 1522, when the Spanish mission of the Trinidad, the flagship of Ferdinand Magellan's voyage of circumnavigation, sighted two small islands around the 5th parallel north, naming them "San Juan". After the conquest of the Philippines in 1565 by the Spanish Empire, the archipelago of Palau became part of the territory of the Captaincy General of the Philippines, established in 1574 as part of the Spanish East Indies with the capital based in the colonial centre in Manila. However, the Spanish presence only began to express with evangelization, began at the end of the 17th century, and its dominance began to take shape in the 18th century. The conscious discovery of Palau came a century later in 1697 when a group of Palauans were shipwrecked on the Philippine island of Samar to the northwest. They were interviewed by the Czech missionary Paul Klein on 28 December 1696. Klein was able to draw the first map of Palau based on the Palauans' representation of their home islands that they made with an arrangement of 87 pebbles on the beach. Klein reported his findings to the Jesuit Superior General in a letter sent in June 1697, equaling to the discovery of Palau. This map and the letter caused a vast interest in the new islands. Another letter written by Fr. Andrés Serrano was sent to Europe in 1705, essentially copying the information given by Klein. The letters resulted in three unsuccessful Jesuit attempts to travel to Palau from Spanish Philippines in 1700, 1708 and 1709. The islands were first visited by the Jesuit expedition led by Francisco Padilla on 30 November 1710. The expedition ended with the stranding of the two priests, Jacques Du Beron and Joseph Cortyl, on the coast of Sonsorol, because the mother ship Santísima Trinidad was driven to Mindanao by a storm. Another ship was sent from Guam in 1711 to save them only to capsize, causing the death of three more Jesuit priests. The failure of these missions gave Palau the original Spanish name Islas Encantadas (Enchanted Islands). Despite these early misfortunes, the Spanish Empire later came to dominate the islands. British traders became prominent visitors to Palau in the 18th century, followed by expanding Spanish influence in the 19th century. Palau, under the name Palaos, was included in the Malolos Congress, the first revolutionary congress in the Philippines which aimed to become fully independent from colonialists. Palau, at the time, was part of the Philippines. Palau had one appointed member to the Congress, becoming the only group of islands in the entire Caroline Islands to be granted high representation in a non-colonial Philippine Congress. The Congress also supported the right of Palau to self-determination if ever it wishes to pursue such a path. During World War I, the Japanese Empire annexed the islands after seizing them from Germany in 1914. Following World War I, the League of Nations formally placed the islands under Japanese administration as part of the South Pacific Mandate. In World War II, Palau was used by Japan to support its 1941 invasion of the Philippines, which succeeded in 1942. The invasion overthrew the American-installed Commonwealth government in the Philippines and installed the Japanese-backed Second Philippine Republic in 1943. During World War II, the United States captured Palau from Japan in 1944 after the costly Battle of Peleliu, when more than 2,000 Americans and 10,000 Japanese were killed. In 1945–1946, the United States re-established control on the Philippines, and managed Palau through the Philippine capital of Manila. By the later half of 1946, however, the Philippines was granted full independence with the formation of the Third Republic of the Philippines, shifting the US Far West Pacific capital to Guam. Palau passed formally to the United States under United Nations auspices in 1947 as part of the Trust Territory of the Pacific Islands established pursuant to Security Council Resolution 21. Four of the Trust Territory districts joined together and formed the Federated States of Micronesia in 1979, but the districts of Palau and the Marshall Islands declined to participate. 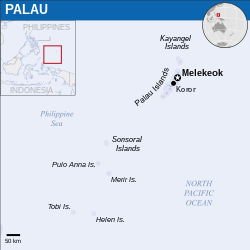 Palau, the westernmost cluster of the Carolines, instead opted for independent status in 1978, which was widely supported by the Philippines, Taiwan, and Japan. It approved a new constitution and became the Republic of Palau on 1 January 1981. It signed a Compact of Free Association with the United States in 1982. In the same year, Palau became one of the founding members of the Nauru Agreement. After eight referenda and an amendment to the Palauan constitution, the Compact was ratified in 1993. 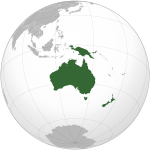 The Compact went into effect on 1 October 1994, marking Palau de jure independent, although it had been de facto independent since 25 May 1994, when the trusteeship ended. Formal diplomatic relations with the Philippines was re-established in the same year, although the two nations already had diplomatic back channels prior to 1994. [citation needed] Palau also became a member of the Pacific Islands Forum. Legislation making Palau an "offshore" financial center was passed by the Senate in 1998. In 2001, Palau passed its first bank regulation and anti-money laundering laws. In 2005, Palau led the Micronesia challenge, which would conserve 30% of near-shore coastal waters and 20% of forest land of participating countries by 2020. In 2012, the Rock Islands of Palau was declared as a UNESCO World Heritage Site. In 2015, Palau became a member of the Climate Vulnerable Forum under the chairmanship of the Philippines, and at the same time, the country officially protected 80% of its water resources, becoming the first country to do so. The protection of its water resources made significant increases in the country's economy in less than two years. In 2017, the nation became the first to establish an eco-promise, known as the Palau Pledge, which are stamped on local and foreign passports. In 2018, Palau and the Philippines began re-connecting their economic and diplomatic relations. The Philippines has supported Palau to become an observer state in ASEAN, as Palau also has Southeast Asian ethnic origins. Capitol of Palau, the seat of government. Palau is a democratic republic. The President of Palau is both head of state and head of government. Executive power is exercised by the government, while legislative power is vested in both the government and the Palau National Congress. The judiciary is independent of the executive and the legislature. Palau adopted a constitution in 1981. The governments of the United States and Palau concluded a Compact of Free Association in 1986, similar to compacts that the United States had entered into with the Federated States of Micronesia and the Republic of the Marshall Islands. The compact entered into force on 1 October 1994, concluding Palau's transition from trusteeship to independence as the last portion of the Trust Territory of the Pacific Islands to secure its independence pursuant to Security Council Resolution 956. The Compact of Free Association between the United States and Palau sets forth the free and voluntary association of their governments. It primarily focuses on the issues of government, economic, security and defense relations. Palau has no independent military, relying on the United States for its defense. Under the compact, the American military was granted access to the islands for 50 years. The U.S. Navy role is minimal, limited to a handful of Navy Seabees (construction engineers). The U.S. Coast Guard patrols in national waters. As a sovereign nation, Palau conducts its own foreign relations. Since independence, Palau has established diplomatic relations with a number of nations, including many of its Pacific neighbors, like Micronesia and the Philippines. On 29 November 1994, the United Nations Security Council passed Resolution 963 recommending Palau's admission to the United Nations. The United Nations General Assembly approved admission for Palau pursuant to Resolution 49/63 on 15 December 1994. Palau has since joined several other international organizations. In September 2006, Palau hosted the first Taiwan-Pacific Allies Summit. Its President has made official visits to other Pacific countries, including Japan. The United States maintains a diplomatic delegation and an embassy in Palau, but most aspects of the countries' relationship have to do with Compact-funded projects, which are the responsibility of the U.S. Department of the Interior's Office of Insular Affairs. For example, as part of this Compact, Palau was granted zip codes 96939 and 96940, along with regular US Mail delivery. In international politics, Palau often votes with the United States on United Nations General Assembly resolutions. Palau is a member of the Nauru Agreement. In 1981, Palau voted for the world's first nuclear-free constitution. This constitution banned the use, storage and disposal of nuclear, toxic chemical, gas and biological weapons without first being approved by a ¾ majority in a referendum. This ban delayed Palau's transition to independence, because while negotiating the Compact, the U.S. insisted on the option to operate nuclear propelled vessels and store nuclear weapons within the territory, prompting campaigns for independence and denuclearisation. After several referendums that failed to achieve a ¾ majority, the people of Palau finally approved the Compact in 1994. In June 2009, Palau announced that it would accept up to seventeen Uyghurs who had previously been detained by the American military at Guantanamo Bay, with some American compensation for the cost of their upkeep. Palau's Division of Marine Law Enforcement patrols the nation's 230,000 square mile exclusive economic zone. They operate two long range patrol boats, the Remeliik and the Kedam, to hunt for poachers and unlicensed fishermen. Smaller boats are used for littoral operations. They are based on Koror. Palau's territory consists of an archipelago located in the Pacific Ocean. Its most populous islands are Angaur, Babeldaob, Koror and Peleliu. The latter three lie together within the same barrier reef, while Angaur is an oceanic island several miles to the south. About two-thirds of the population lives on Koror. The coral atoll of Kayangel is north of these islands, while the uninhabited Rock Islands (about 200) are west of the main island group. A remote group of six islands, known as the Southwest Islands, some 375 miles (604 km) from the main islands, make up the states of Hatohobei and Sonsorol. Palau has a tropical rainforest climate with an annual mean temperature of 28 °C (82 °F). Rainfall is heavy throughout the year, averaging 3,800 mm (150 in). The average humidity is 82% and, although rain falls more frequently between July and October, there is still much sunshine. Typhoons are rare, as Palau lies outside the main typhoon zone. The strongest typhoon that struck Palau since reliable records was Typhoon Haiyan in 2013. A mandatory emergency evacuation was issued for Kayangel. A storm surge damaged several houses. Despite residents' refusal to evacuate safely, no fatalities or major injuries were reported. While much of Palau remains free of environmental degradation, areas of concern include illegal dynamite fishing, inadequate solid waste disposal facilities in Koror and extensive sand and coral dredging in the Palau lagoon. As with other Pacific island nations, rising sea level presents a major environmental threat. Inundation of low-lying areas threatens coastal vegetation, agriculture, and an already insufficient water supply. Wastewater treatment is a problem, along with the handling of toxic waste from fertilizers and biocides. The nation is also vulnerable to earthquakes, volcanic activity, and tropical storms. Palau already has a problem with inadequate water supply and limited agricultural areas to support its population. On 5 November 2005, President Tommy E. Remengesau, Jr. took the lead on a regional environmental initiative called the Micronesia challenge, which would conserve 30% of near-shore coastal waters and 20% of forest land by 2020. Following Palau, the initiative was joined by the Federated States of Micronesia, the Marshall Islands, and the U.S. territories of Guam and Northern Mariana Islands. Together, this combined region represents nearly 5% of the marine area of the Pacific Ocean and 7% of its coastline. On 25 September 2009, Palau announced that it would create the world's first shark sanctuary. Palau banned all commercial shark fishing within the waters of its exclusive economic zone (EEZ). The sanctuary protects about 600,000 square kilometers (230,000 sq mi) of ocean, a similar size to France. President Johnson Toribiong announced the sanctuary at a meeting of the United Nations. President Toribiong proposed a worldwide ban on fishing for sharks. In 2012, Palau received the Future Policy Award from World Future Council, because "Palau is a global leader in protecting marine ecosystems". Palau's economy consists primarily of tourism, subsistence agriculture and fishing. Tourist activity focuses on scuba diving and snorkeling in the islands' rich marine environment, including its barrier reefs' walls and World War II wrecks. The government is the largest employer, relying heavily on U.S. financial assistance. Business and tourist arrivals numbered some 50,000 in fiscal year 2000–2001. The population enjoys a per capita income twice that of Micronesia as a whole. Long-term prospects for the key tourist sector have been greatly bolstered by the expansion of air travel in the Pacific, the rising prosperity of leading East Asian countries and the willingness of foreigners to finance infrastructure development. Air service has at times been spotty. Palau Micronesia Air, Asian Spirit and Pacific Flier provided service to the Philippines and other destinations at various times during the 2000s, but all suspended service. United Airlines now provides near-daily service to and from Guam, and once-weekly service to Yap. Also, Korean Air provides service three times per week to Incheon. In November 2006, Palau Saving Bank officially announced bankruptcy. On 13 December 2006, the Palau Horizon reported that 641 depositors had been affected. Among them, 398 held less than US$5,000, with the remainder ranging from US$5,000 to US$2 million. On 12 December 79 affected people received compensation. Mr. Toribiong said, "The fund for the payout came from the balance of Palau government's loan from Taiwan." From a total of US$1 million, which originally was for assisting Palau's development, US$955,000 was left at the time of bankruptcy. Toribiong requested the Taiwanese government use the balance to repay its loans. Taiwan agreed to the request. The compensation would include those who held less than US$4,000 in an account. The income tax has three brackets with progressive rates of 9.3 percent, 15 percent, and 19.6 percent respectively. Corporate tax is four percent, and the sales tax is zero. There are no property taxes. Major tourist draws in Palau include Rock Islands Southern Lagoon, a UNESCO world heritage site, and four tentative UNESCO sites, namely, Ouballang ra Ngebedech (Ngebedech Terraces), Imeong Conservation Area, Yapease Quarry Sites, and Tet el Bad (Stone Coffin). Palau International Airport provides scheduled direct flights with Guam, Manila, Seoul and Taipei and since December 2010, Tokyo-Narita. Palau Pacific Airways also has charter flights to and from Hong Kong and Macau. In addition, the states of Angaur and Peleliu have regular service to domestic destinations. Freight, military and cruise ships often call at Malakal Harbor, on Malakal Island outside Koror. The country has no railways, and of the 61 km or 38 mi of highways, only 36 km or 22 mi are paved. Driving is on the right and the speed limit is 40 km/h (25 mph). Taxis are available in Koror. They are not metered and fares are negotiable. Transportation between islands mostly relies on private boats and domestic air services. However, there are some state run boats between islands as a cheaper alternative. The population of Palau is approximately 21,503, of whom 73% are native Palauans of mixed Melanesian, and Austronesian descent. There are many Asian communities within Palau. Filipinos form the largest Asian group and second largest ethnic group in the country. There are significant numbers of Chinese and Koreans. There are also smaller numbers of Palauans of mixed or full Japanese ancestry. Smaller numbers of Bangladeshi and Nepalese migrant workers and their descendants who came to the islands during the late 1900s can also be found. Most Palauans of Asian origin came during the late 1900s with many Filipinos, Chinese, Bangladeshis and Nepalese coming to Palau as unskilled workers and professionals. There are also small numbers of Europeans and Americans. The official languages of Palau are Palauan and English, except for two states (Sonsorol and Hatohobei) where the local language, Sonsorolese and Tobian, respectively, along with Palauan, is official. Japanese is spoken by some older Palauans and is an official language in the State of Angaur. Including second-language speakers, more people speak English than Palauan in Palau. Additionally, a significant portion of the population speak the Filipino language. According to 2015 estimates 45.3% of the population is Roman Catholic (due to its shared colonial heritage with the Philippines), 6.9% Seventh-day Adventist, 34.9% other Protestant (due to American colonial rule), 5.7% Modekngei and 3.0% Muslim (due to its shared Islamic heritage with southern Philippines). In 2009, the small Jewish community sent two cyclists to the 18th Maccabiah Games. The German and Japanese occupations of Palau both subsidized missionaries to follow the Spanish. Germans sent Roman Catholic and Protestant, Japanese sent Shinto and Buddhist, and Spaniards sent Roman Catholic missionaries as they controlled Palau. Three quarters of the population are Christians (mainly Roman Catholics and Protestants), while Modekngei (a combination of Christianity, traditional Palauan religion and fortune telling) and the ancient Palauan religion are commonly observed. Japanese rule brought Mahayana Buddhism and Shinto to Palau, which were the majority religions among Japanese settlers. However, following Japan's World War II defeat, the remaining Japanese largely converted to Christianity, while the remainder continued to observe Buddhism, but stopped practicing Shinto rites. There are also approximately 400 Bengali Muslims in Palau, and recently a few Uyghurs detained in Guantanamo Bay were allowed to settle in the island nation. The cuisine includes local foods such as cassava, taro, yam, potato, fish and pork. Western cuisine is favored among young Palauans and the locals are joined by foreign tourists. The rest of Micronesia is similar with much less tourism, leading to fewer restaurants. [citation needed] Tourists eat mainly at their hotels on such islands. Some local foods include an alcoholic drink made from coconut on the tree; the drink made from the roots of the kava; and the chewing of betel nuts. The traditional government system still influences the nation's affairs, leading the federal government to repeatedly attempt to limit its power. Many of these attempts took the form of amendments to the constitution that were supported by the corporate sector to protect what they deemed should be free economic zones. [citation needed] One such example occurred in early 2010, where the Idid clan, the ruling clan of the Southern Federation, under the leadership of Bilung, the Southern Federation's queen, raised a civil suit against the Koror State Public Lands Authority (KSPLA). The Idid clan laid claim over Malakal Island, a major economic zone and Palau's most important port, citing documents from the German Era. The verdict held that the Island belonged to the KSPLA. The present-day "traditional" government of Palau is a continuation of its ancestor, composed of practices that span thousands of years. [citation needed] Traditionally, Palau was hierarchically organized. The lowest level is the village or hamlet, then the chiefdom (now politically referred to as a state) and finally alliances of chiefdoms. In ancient times, numerous federations divided power, but upon the 17th century introduction of firearms by the British, an imbalance of power occurred. Baseball is a popular sport in Palau after its introduction by the Japanese in the 1920s. The Palau national baseball team won the gold medal at the 1990, 1998 and 2010 Micronesian Games, as well as at the 2007 Pacific Games. Palau also has a national football team, organized by the Palau Soccer Association, but is not a member of FIFA. The Association also organizes the Palau Soccer League. Primary education is required until age of 16. Schools include both public and private institutions as well as some fields of study available at Palau Community College. For further undergraduate, graduate and professional programs, students travel abroad to attend tertiary institutions. Popular choices among Palauan scholars include the San Diego State University, University of the Philippines, Mindanao State University, and the University of the South Pacific. Palau has its own cuisine, for instance, a dessert called tama. Palauan cuisine includes local foods such as cassava, taro, yam, potato, fish and pork. It is also influenced by neighboring Philippines' cuisine, notably on its Asian-Latin dishes. Fruit bat soup is a commonly referenced Palauan delicacy. ^ "HUMAN DEVELOPMENT REPORT 2018 – Statistical annex". United Nations Development Programme. 2018. ^ Constitution of Palau Archived 26 May 2013 at the Wayback Machine. (PDF). palauembassy.com. Retrieved 1 June 2013. ^ "Statistical Yearbook 2015". Republic of Palau Bureau of Budget and Planning Ministry of Finance (2016-02-01). Retrieved on 2018-08-21. ^ Culture of Palau – Every Culture. Retrieved 25 May 2012. ^ The Bais of Belau – Underwater Colours. Retrieved 25 May 2012. ^ Palau: Portrait of Paradise. Underwater Colours. Retrieved 25 May 2012. ^ Serrano, Andres (1707). Los siete principes de los Angeles: validos del Rey del cielo. Misioneros, y protectores de la Tierra, con la practica de su deuocion. por Francisco Foppens. pp. 132–. ^ Francis X. Hezel, SJ, Catholic Missions in the Carolines and Marshall Islands. Micsem.org. Retrieved on 12 September 2015. ^ Balabo, Dino (December 10, 2006). "Historians: Malolos Congress produced best RP Constitution". Philippine Star. Retrieved 12 August 2013. ^ Dorothy Perkins (1997). Japan Goes to War: A Chronology of Japanese Military Expansion from the Meiji Era to the Attack on Pearl Harbor (1868-1941). DIANE Publishing. p. 166. ISBN 9780788134272. Admiral Takeo Takagi led the Philippines support force to Palau, an island 500 miles east of the southern Philippines where he waited to join the attack. ^ "Pacific Island Battleground Now the Republic of Belau". Bangor, Maine, USA: Bangor Daily News, via Google News. Associated Press. 23 January 1981. ^ "Palau Gains Independence on Saturday". Salt Lake City, Utah, USA: The Deseret News, via Google News. Associated Press. 30 September 1994. ^ Centre, UNESCO World Heritage. "Palau - UNESCO World Heritage Centre". whc.unesco.org. ^ "Tiny Island Nation's Enormous New Ocean Reserve is Official". 28 October 2015. ^ "This Small Island Nation Makes a Big Case For Protecting Our Oceans". 3 April 2017. ^ "Pacific island forces visitors to sign eco-pledge". ^ a b "PH, Palau agree to enhance ties". ^ a b c "Compact of Free Association: Palau's use of and accountability for U.S. assistance and prospects for economic self-sufficiency" (PDF). Report to Congressional Committees. GAO-08-732: 1–2. 10 June 2008. Retrieved 7 September 2014. ^ United Nations General Assembly Resolution 49/63, Admission of the Republic of Palau to Membership in the United Nations, adopted 15 December 1994. Un.org. Retrieved on 12 September 2015. ^ "The President of the Republic of Palau to Visit Japan". Tokyo: Ministry of Foreign Affairs of Japan. 2014-12-15. ^ General Assembly – Overall Votes – Comparison with U.S. vote lists Palau as in the country with the third high coincidence of votes. Palau has always been in the top three. ^ "Pacific nations extend bans on tuna fishing". Radio Australia. East West Center. 5 October 2010. Retrieved 6 October 2010. ^ "The Constitution of the Republic of Palau". The Government of Palau. 2 April 1979. Retrieved 1 November 2009. ^ "Issues Associated. With Palau's Transition to Self-Government" (PDF). Government Accountability Office. July 1989. Retrieved 1 November 2009. ^ Lyons, Richard D. (6 November 1994). "Work Ended, Trusteeship Council Resists U.N. Ax for Now". The New York Times. Retrieved 1 November 2009. ^ "Trusteeship Mission reports on Palau voting. (plebiscite on the Compact of Free Association with the United States)". 27 (2). UN Chronicle. June 1990. ^ "Pacific state Palau to take Uighur detainees". CTV News. 10 June 2009. Archived from the original on 1 January 2013. Retrieved 11 June 2009. ^ Kirit Radia (10 June 2009). "US and Palau wrangling over Gitmo transfer details, including $$$". ABC News. Archived from the original on 1 November 2009. ^ "Palau Government still not sure if Uighurs are coming". Radio New Zealand International. 30 June 2009. Archived from the original on 1 November 2009. ^ "Six Guantanamo Uighurs arrive in Palau: US". Agence France-Presse. 31 October 2009. Archived from the original on 31 October 2009. ^ "Palau receives aid boost from US". australianetworknews.com. 30 January 2010. Archived from the original on 4 February 2010. The president insisted there was no link to the island's hosting of six inmates from Guantanamo Bay. Palau had earlier rejected a 156 million dollar offer and the settlement came after the island nation agreed to resettle six Muslim Uighurs who had been held for more than seven years at the US naval base at Guantanamo Bay. The six arrived in Palau in November. But Johnson said the two issues were not related. ^ a b L.N. Reklai (2017-04-25). ""Euatel" patrol boat handover today". islandtimes.us. Retrieved 2018-04-22. This is third in the series of patrol boats of this size donated by The Nippon Foundation to Palau. Kabekl M’tal was donated in 2012 and Bul was donated in 2014. ^ Ongerung Kambes Kesolei, Tia Belau (2017-12-22). "Palau Gets New Patrol Boat". www.pacificnote.com. Retrieved 2018-04-22. ^ "Operation Kaukledm". 2017-05-08. Retrieved 2018-04-22. ^ Bernadette H. Carreon (2016-03-03). "Palau's maritime surveillance gets boost with new patrol boat". = www.postguam.com. Koror, Palau. Retrieved 2018-04-22. Palau currently has a lone patrol boat, PSS H.I Remeliik, that is about 31.5 meters long. The Remeliik was donated by the Australian government in 1996. The vessel is scheduled to get an upgrade funded by the Australian government by 2018. ^ Urbina, Ian (21 February 2016), "Palau vs the Poachers", The New York Times Magazine, pp. 40–49, Nearly 9,000 miles away, the Remeliik, a police patrol ship from the tiny island nation Palau, was pursuing a 10-man Taiwanese pirate ship, the Shin Jyi Chyuu 33, through Palauan waters. ^ Kitamoto, Asanobu. "Histogram of Typhoons Within 1 Degree of Koror". Digital Typhoon. Retrieved 25 January 2015. ^ "Climatological Information for Palau Islands, Pacific Islands, United States". Hong Kong Observatory. ^ "Palau creates world's first shark haven". The Philippine Star. 26 September 2009. Archived from the original on 4 January 2013. Retrieved 28 September 2009. ^ Richard Black (25 September 2009). Palau pioneers 'shark sanctuary'. BBC News. ^ a b c "Palau's EEZ becomes shark sanctuary". Xinhua News Agency. 27 September 2009. Archived from the original on 30 September 2009. Retrieved 28 September 2009. ^ Sophie Tedmanson (26 September 2009). "World's first shark sanctuary created by Pacific island of Palau". The Times. London. Retrieved 28 September 2009. ^ Ker Than (25 September 2009). "France-Size Shark Sanctuary Created – A First". National Geographic. Retrieved 28 September 2009. ^ "Palau creates shark sanctuary to protect tourism and prevent overfishing". Radio New Zealand. 27 September 2009. Retrieved 28 September 2009. ^ Cornelia Dean (24 September 2009). "Palau to Ban Shark Fishing". The New York Times. Retrieved 28 September 2009. ^ "Tiny Nation of Palau Proves Sharks Worth More Alive Than Dead". Jakarta Globe. 22 October 2012. Archived from the original on 27 October 2012. ^ Ghim-Lay Yeo. "Palau's PacificFlier relooks business plan after suspension". Flightglobal. Retrieved 13 September 2011. ^ 李光儀、王光慈. "帛琉銀行倒閉 賠償存戶竟由台灣埋單 (Taiwan pay for the bill of compensation for PSB bankruptcy)". udn.com Center. Archived from the original on 24 December 2010. Retrieved 20 December 2010. ^ Centre, UNESCO World Heritage. "Rock Islands Southern Lagoon". UNESCO World Heritage Centre. ^ "All the Schedules and Prices for Palau's State Ferries between Koror, Peliliu and Angour". 17 February 2016. ^ R. G. Crocombe (2007). Asia in the Pacific Islands: Replacing the West. editorips@usp.ac.fj. pp. 60, 61. ISBN 978-982-02-0388-4. ^ "CIA – The World Factbook – Field Listing :: Languages". Central Intelligence Agency. Archived from the original on 17 February 2010. Retrieved 17 February 2010. ^ Sokolow, Moshe (6 December 2012). "I've Got Friends in Low-lying Places..." Jewish Ideas Daily. Retrieved 7 August 2013. ^ "Palau Education System". www.classbase.com. Retrieved 21 June 2016. ^ "Tama – A Year Cooking the World". ayearcookingtheworld.com. Retrieved 2018-01-24. ^ "Fruit bat soup has chicken-like taste". Newcastle Herald. 2016-06-12. Retrieved 2018-03-09. "Palau". The World Factbook. Central Intelligence Agency. Australian library online, subscription, or membership via institutional access, is required.